"Now serving 250 agencies across the nation." How can it work for My Team? Our browser version is available for Apple devices, Windows, and Android. Browser Requires: IE 10 or higher, Chrome, Safari, Android Chrome. The full iPad Version with offline ability is always available here. CrimePad® is the professional-grade iPad, Windows, and Android app that allows every law enforcement user to record, track, maintain, collaborate and report on all the data within a criminal investigation or a crime scene. Say goodbye to paper! Use Voice Dictation or easily type out digital forms for a variety of elements within a case or scene. Effortlessly collaborate with the rest of your team while working an investigation. 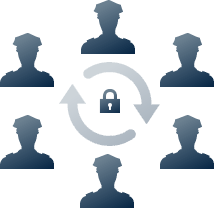 Share data securely in real-time across devices. Maximize the time you can spend in the field. Automatically generate and print your reports out in the field and with one button. By joining our monthly newsletter, you will have exclusive insight in upcoming features and what’s happening within the Visionations community. Our team offers the synergy of substantial forensic science, crime scene, and national security expertise combined with leading professional user-experience architecture. Jane M. Homeyer, PhD brings to Visionations over 20 years of experience in innovative practices in both the Federal government and private sector. With expertise that spans the fields of forensic science, crime scene investigation, and national security, she has held senior executive positions at the Federal Bureau of Investigations (FBI), Northern Illinois Police Crime Laboratory (NIPCL), and at other federal agencies. 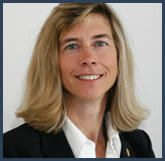 Dr. Homeyer also served as the Dean of Academic Studies and Professional Development at the FBI. For more than 16 years, Jeff has been providing forensic analyses in the fields of latent print comparisons and bloodstain pattern analysis. 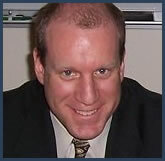 In 2002, Jeff began work with Porter Lee and helped to develop their Laboratory Information Management System called the BEAST. He managed implementations for many large-scale projects for agencies such as the NYPD, New Jersey State Police, Kansas Bureau of Investigation, Kentucky State Police and Florida Department of Law Enforcement (FDLE). © 2013 Visionations, LLC. All rights reserved. 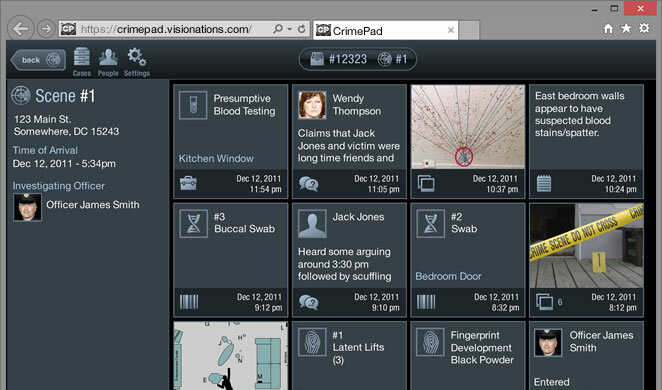 CrimePad® is a registered trademark of Visionations, LLC.